This program gives a short history of the Sacred Harp and includes music from four Alabama based shape-note singing books, the Denson and Cooper revisions of The Sacred Harp, The Christian Harmony and The Colored Sacred Harp. 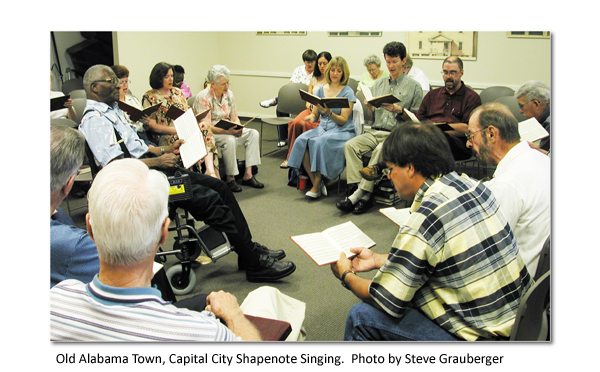 On July 21st, 2016 the 30th Annual Capital City Four-Book Shapenote Singing, located at the Loeb Center in Old Alabama Town (corner of south McDonough and Columbus streets) Montgomery, will take place starting at 9:30 am and continue until 3 pm. The event is open to the public. Yvette Jones-Smedley interviews Michael Medcalf who presently serves as the Director of the BFA/Dance Program and an Assistant Professor of Dance at Alabama State University in Montgomery, AL. With over thirty years of experience in the field of dance, Mr. Medcalf continues to actively seek out challenging and engaging artistic and educational opportunities that expand his range as an educator, arts administrator, choreographer, and performing artist. This program is a rebroadcast of ACTC director Joey Brackner interviewing preeminent Alabama historian Dr. Wayne Flynt about his book Alabama in the Twentieth Century. In the interview Dr. Flynt outlines the significant cultural contributions of Alabamians during the late century. Wayne Flynt is the Distinguished University Professor of History at Auburn University.